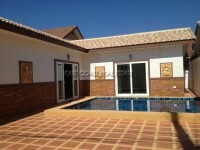 This private pool family home is located along Siam Country Club road, in East Pattaya Side. Offering a relatively short and simple drive into downtown Pattaya, easy access to the larger shopping malls, and hypermarkets, plus there are various shops, restaurants, and activities right on the doorstep. The house can be bought fully furnished or partial furnished and it has a nice garden and a private swimming pool. There is covered off road parking, and electric gates. Inside the property there are 2 large en-suite bedrooms, plus a smaller guest bedroom, and guest bathroom. There is a generous lounge, and outdoor space to relax. The property is in Thai Company name, so tax and transfers will be very cheap and without any headache. Living area : 160 sqm.